Halloween time or not, there’s little more terrifying than liver. 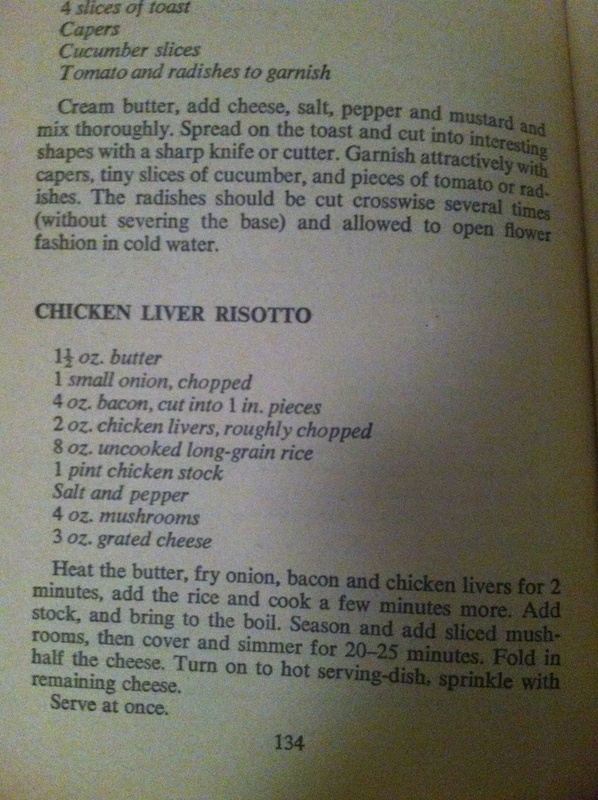 This 1970s chicken liver risotto recipe from Vincent Price — courtesy of Jenny from Silver Screen Suppers — is more treat than trick. My mother armed her cooking arsenal with Vincent Price recipes early and — lucky us — his Yorkshire pudding, Quiche Lorraine and Sweet Mouthful (Boccone Dolce) remain in heavy rotation. 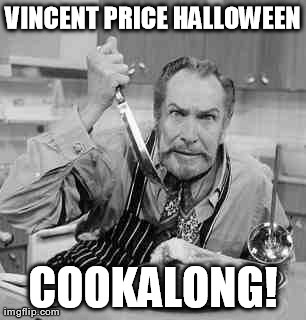 When Jenny announced her Vincent Price Halloween Cookalong, I was keen to take part in the virtual reality potluck party because I am a Halloween freak, and I knew the recipes were going to be solid. When I first saw the bacon, chicken livers, onions, mushrooms, and cheese, the flavours made me think of autumn. How woodsy and fitting for Halloween. If there was a killer lurking nearby, even better. Price’s recipe is brief: there are no fussy risotto instructions warning that you’ll fail if you aren’t simmering your stock in a nearby pot, or that you’ll end up with a sticky clump of something resembling risotto if you don’t add slowly as each ladleful evaporates. No matter. It works. I’ll admit I was frightened the bacon fat is never drained, but I got over it when saw the glistening grains of rice coated in that swirling sheen of fat. 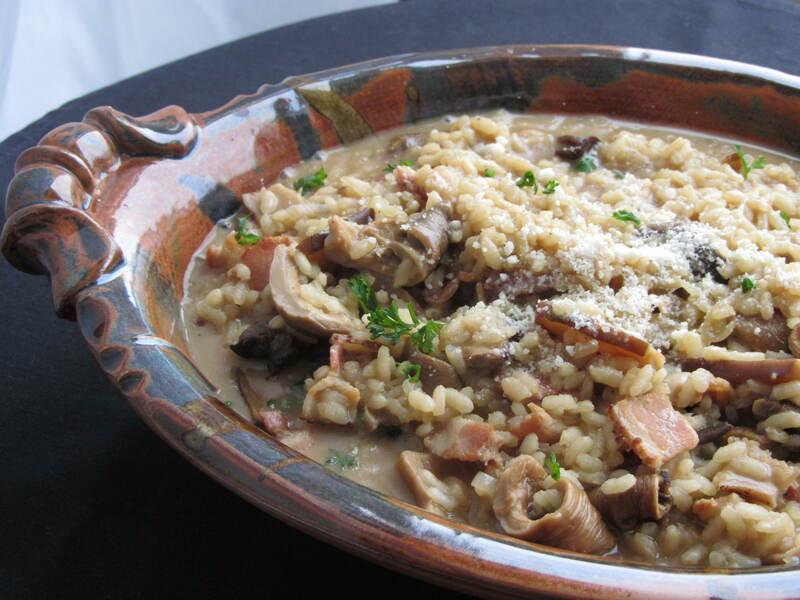 If you are a chicken liver hater, you could leave them out and enjoy a bacon mushroom risotto, but in truth the livers break down and impart an earthy flavour that really gives the dish body. This is a creamy, rich risotto and perfect as it is. I was so tempted to add a splash of brandy to the livers, or a glug of white wine as I usually do as I’m stirring the rice constantly. But I’m glad I made it as written. Thanks Jenny for your deliciously demented idea and letting me play along, and kudos global potluckers — I’m loving your blogs! Thanks GG! It was an amazingly creamy and rich risotto. Well worth it! Thanks Helen, I was lucky — no scary beef heart! I think I might try your mushrooms, they look really good! Saucy Cherie – this looks utterly GORGEOUS. Mmmm – your photos are making me drool. I’ve just nipped over to see your Boccone Dolce too – OMG that looks utterly divine. Thanks for participating in the “deliciously demented” challenge. It was so much fun and I just know that Vincent would approve of us all attempting his wonderful recipes and enjoying them to the max. He loved to share his expertise and really wanted cooks to enjoy the cooking experience as well as the food and I think the Halloween Cookalong has really shown that for us – it is so! I urge everyone to give the Boccone Dolce a go — it is so delicious. Jenny, I’m sensing a romantic Valentine’s Day Love You to Death project a la Vincent Price! Har. Round 2! I don’t do LIVERS but this makes me want to throw caution to the wind and also cause BACON. Susie, I’m sure you can skip the livers. 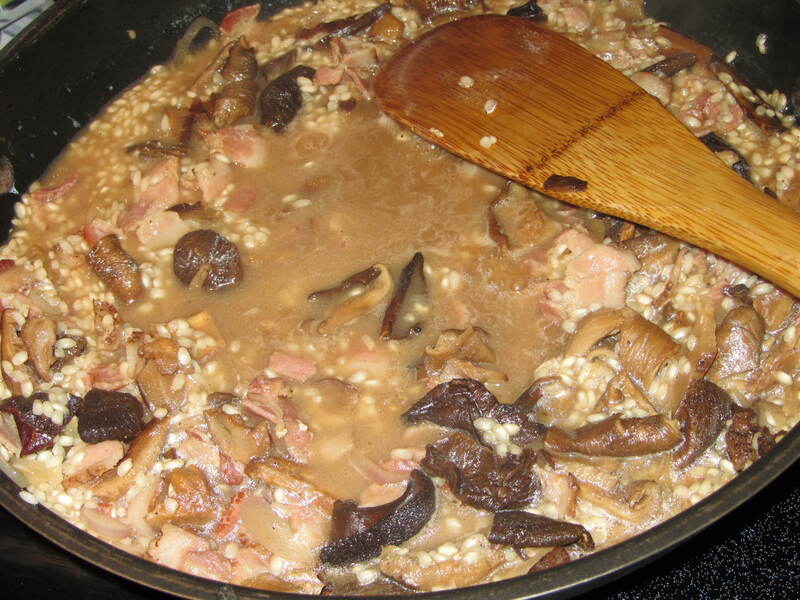 There is so much flavour with the bacon and mushrooms. I was really lucky to get this and not CLAMS! I actually like chicken livers and man this looks good! I think I need to add this one to my list too! My husband loves chicken livers, but I don’t make them as often as I really ought to (they’re so nutritious!) because I don’t have that many different recipes for them. I do make Vincent Price’s bolognese with chicken livers, which is excellent. I grew up with Vincent Price’s recipes, too. My parents had a copy of Treasury of Great Recipes and made Caesar salad A LOT. Oh, I will have to try the bolognese. Are we lucky our moms cooked those recipes! “Deliciously demented” – I think you’ve come up with next year’s theme! Oh, this looks and sounds delicious, yes, with the livers! I am one of the ones who is scared of livers – but you are making me wonder if I should give it a go. I was delighted when I got the deviled shrimps to do!